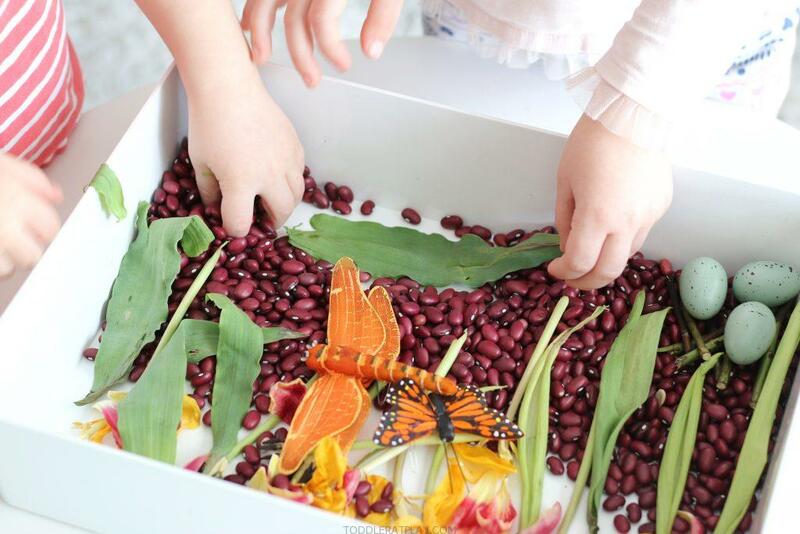 Spring is in the air and this Spring Sensory Bin is the perfect way to celebrate! After a long winter, my kids and I are super excited for more sunshine and warmer temperatures. 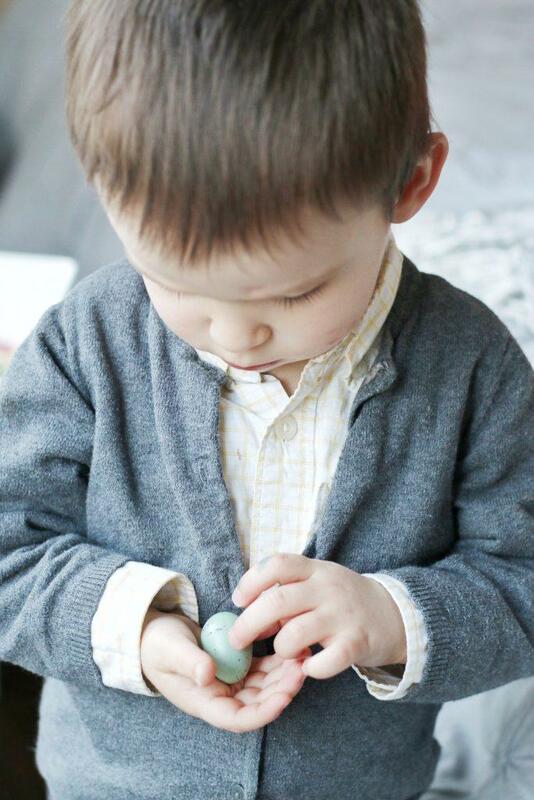 My kids love the outdoors and we try to spend every day no matter how cold it is outside at least for a bit and the “6 weeks early Spring” gets us super giddy! 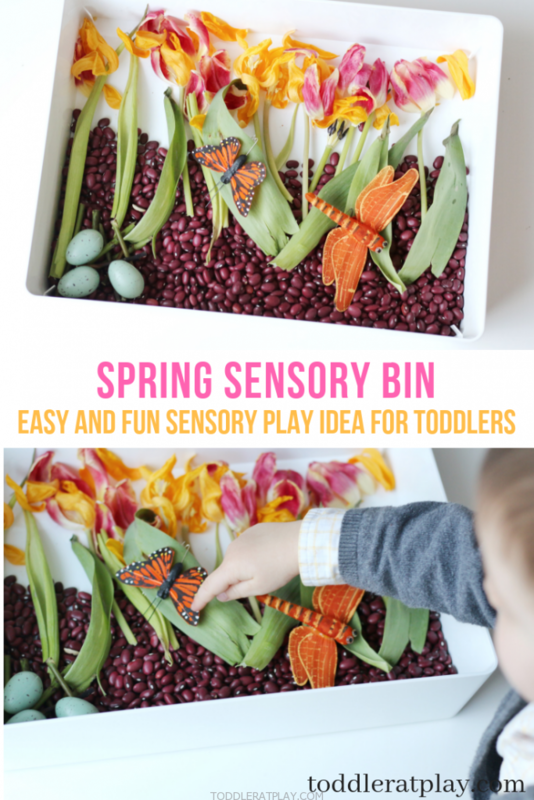 But until then I’ve got this super easy and sweet Spring Sensory Bin to set the mood. 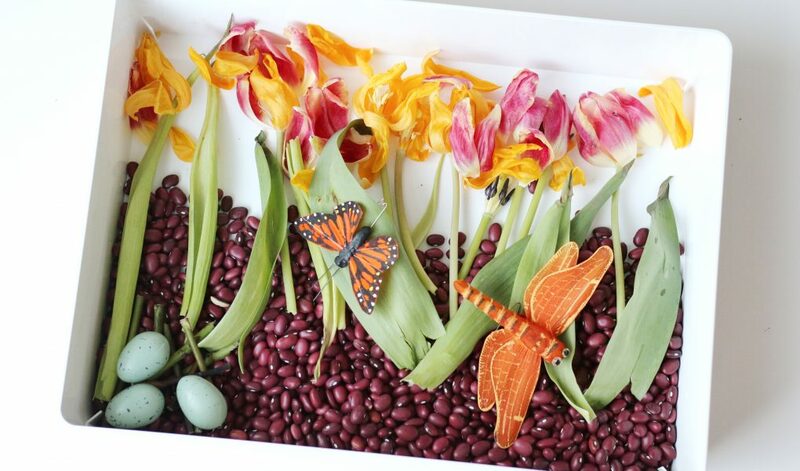 I’ve used old flowers (which have served their days and withered), some beans for the ground and a few nature add-ins. Kid’s loved this bin and spend a good long hour playing, digging and mixing. They got really creative and wrapped the eggs in leaves, made them nests, cleared pathways, built forests, arranged pillows and beds, wrapped twigs in leaves and even made swings from wide leaves. They were playing with what they had, imagining and getting creative. It was awesome to watch! 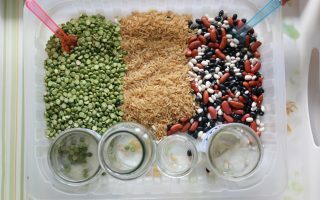 Dump the beans into the bin and arrange them so they’re covering half of the bottom. Add the withered flowers and leaves on top. 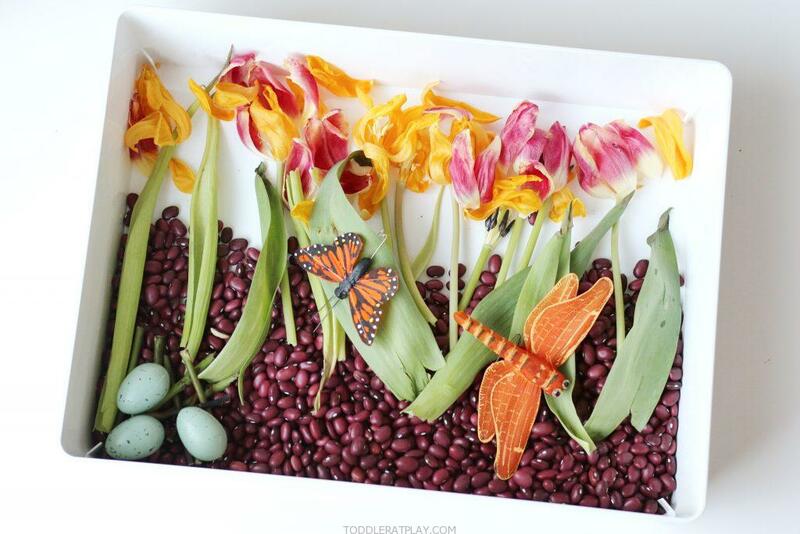 Lastly add the plastic birds eggs, butterfly and dragonfly. 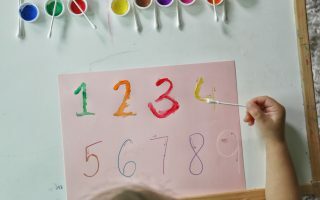 – Sensory Play: Creative Play describes it very well! 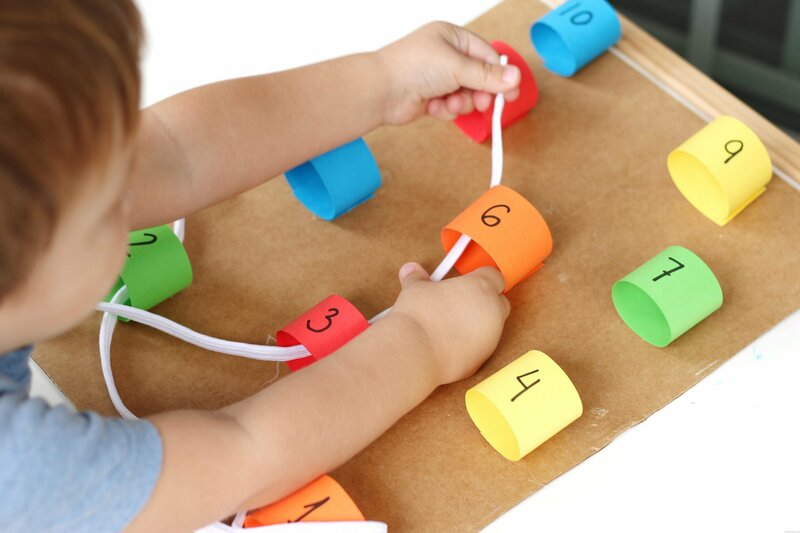 -Independent play: this activity is great for independent play, quiet time, time outs, mama needs to make a phone call, etc. 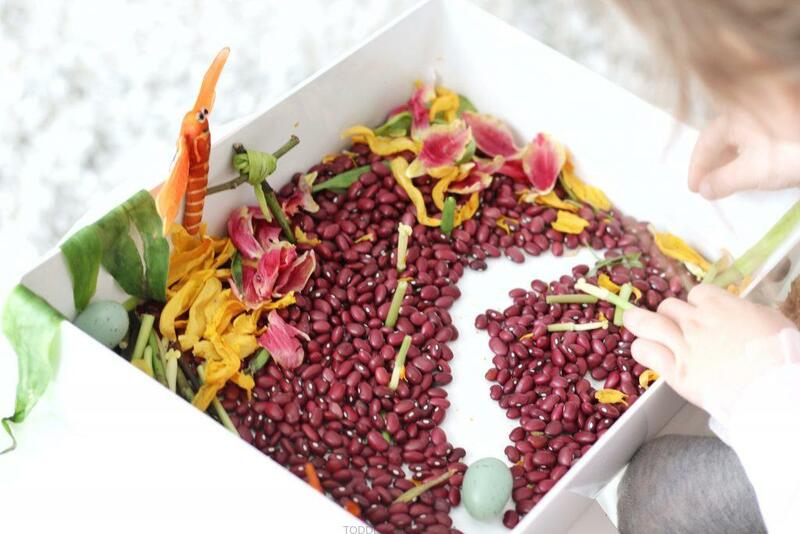 -Fine motor skills: picking up the beans, eggs and all of the add-ins. WATCH THIS TODDLER AT PLAY POPULAR QUICK TUTORIAL + SUBSCRIBE TO OUR YOUTUBE CHANNEL! 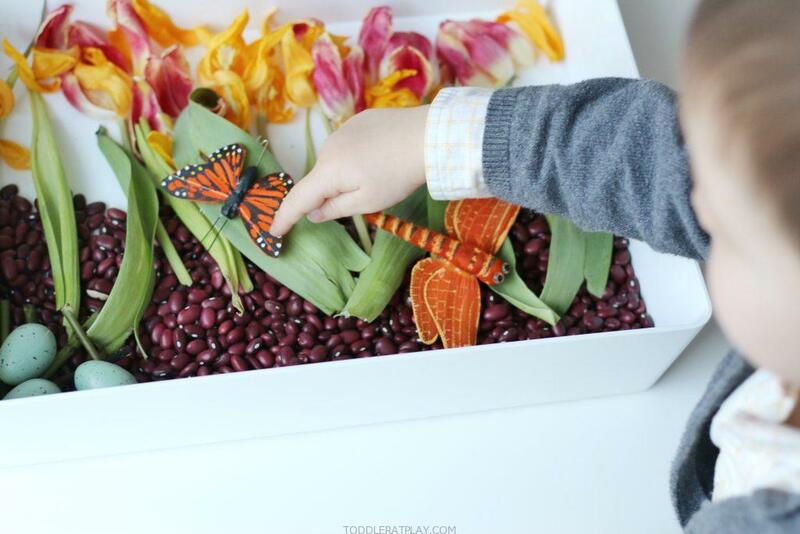 MAKE THIS SENSORY PLAY ACTIVITY TODAY, IT’S PERFECT FOR SPRING!